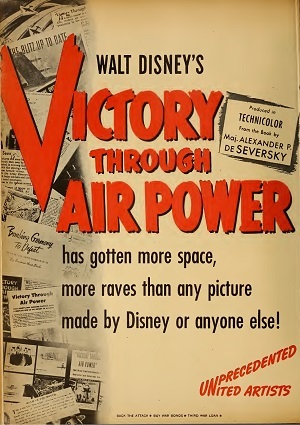 Victory Through Air Power is based on the book with the same name, written by Alexander P. de Seversky. Right after reading the book, Walt Disney wanted to make a movie in order to transmit the message of the book. At the time, it was considered to be a war propaganda film for civilians, where they could see the actual benefits of going to war against Germany, as well as how would it impact on the world. Airplanes are a mayor theme on this film, and most of it is based on how planes could lead to victory, independently of ground offensive.